Imagine sitting upon a vast lawn, on a cozy blanket, surrounded by other like-minded souls, on a summer’s night. 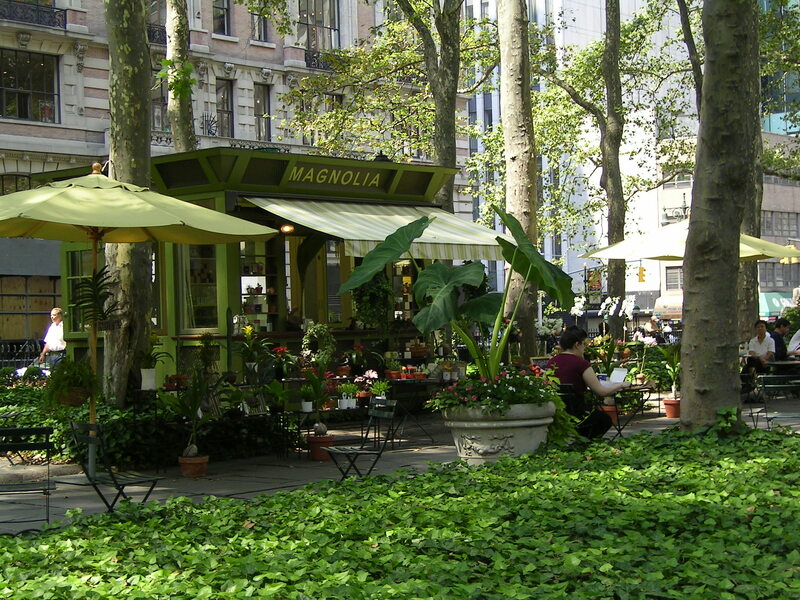 You’re eating a scrumptious sandwich, picked up from a local eatery and enjoying the lush plantings that surround you. Dusk begins to settle in and the outdoor screen starts showing the classic thriller, Rosemary’s Baby. But, guess what? You’re not in Kansas (so to speak) or a friendly Canadian small town, you’re in the middle of New York City, Manhattan to be precise. And you’re sitting with hundreds of well-behaved urbanites in the middle of Bryant Park. In the daylight, this is what the park looks like. 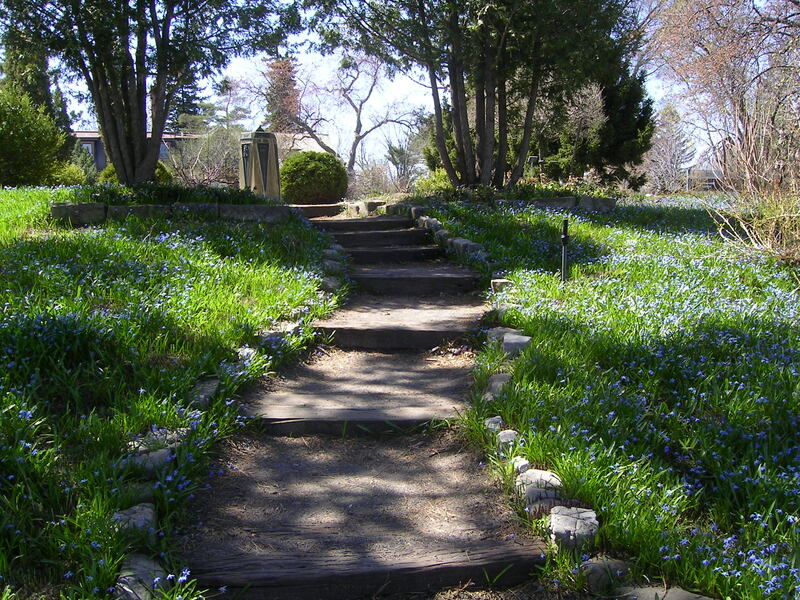 Crushed stone paths surround the giant lawn, bounded by spectacularly colourful plantings (designed by the incomparable Lynden B. Miller) that are in their prime by late summer. 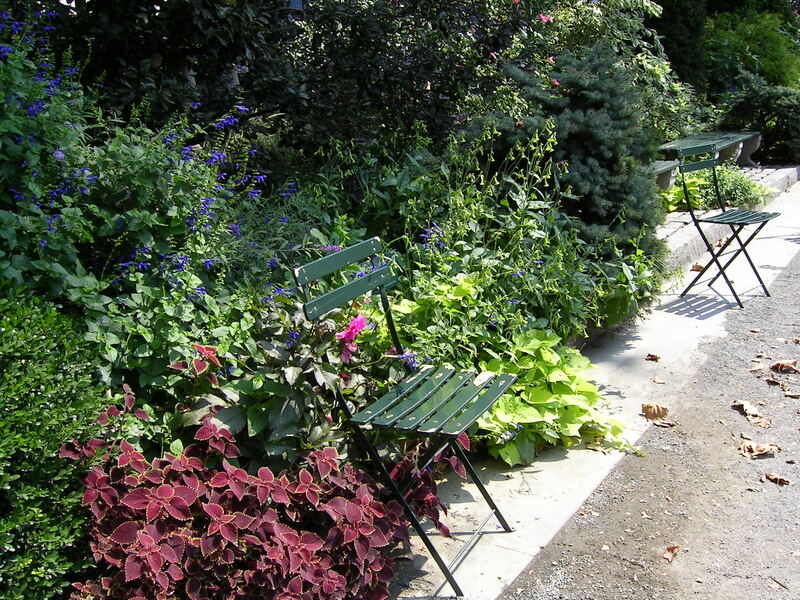 Bistro chairs and tables, reminiscent of a European park, cluster around, beckoning you to sit down and stay a while. 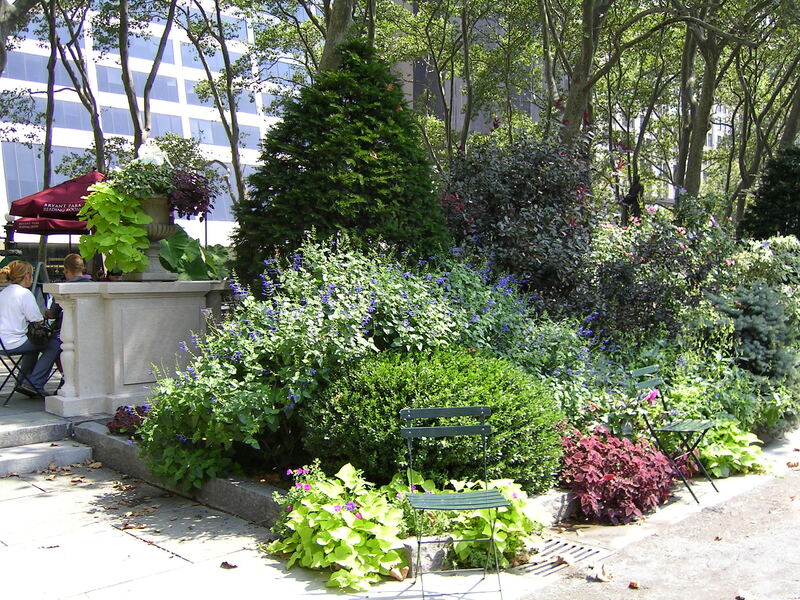 The piece of valuable real estate now known as Bryant Park has a long and storied history. In the 19th century, it accommodated a potter’s field, then a water reservoir and state-of-the-art aquaduct system, a ‘Crystal Palace’ and observatory, and then an encampment for Union army troops. 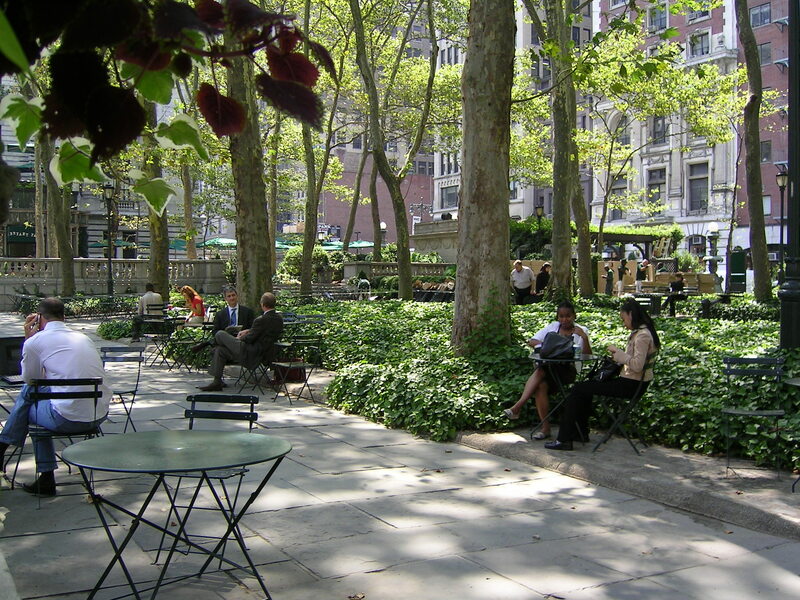 In 1884 the area was renamed Bryant Park and work was completed in 1911 on the New York Public Library that stands next to it. – the place degenerated for the next forty years into a spot where no one ventured except for drug dealers and ne’er do wells. Several important names including Rockefeller, Andrew Heiskell (then Chairman of Time Inc. and the New York Public Library), and Daniel A. Biederman (a Harvard Business School graduate and systems consultant with a reputation as an innovator in downtown management) got the show on the road and made Bryant Park the spectacular place it is today. 1. 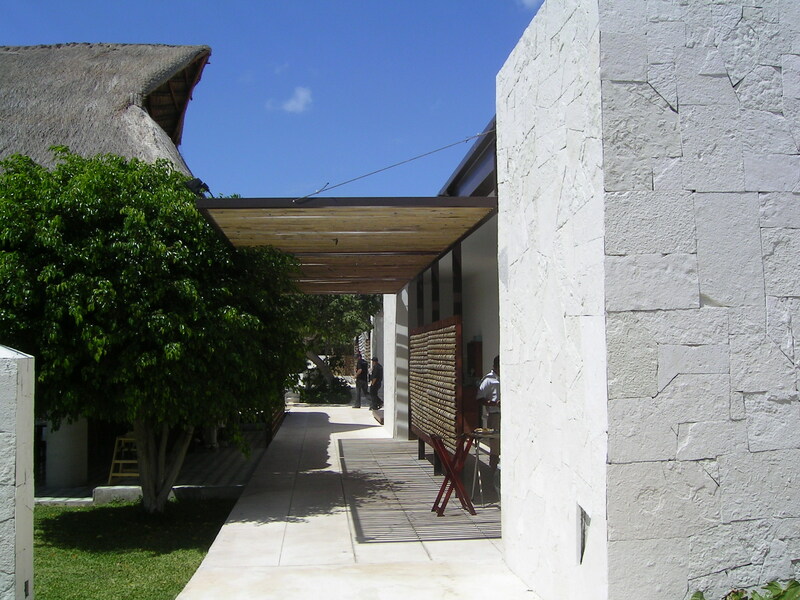 Its beauty – this translates into both the beauty of the design but also the quality of care that is dedicated towards the plantings and the maintenance of the well used paths and patios. 2. Its people friendliness – no longer dark and dingy, the plantings and hard surfaces have been made more accessible and visually open, so visitors no longer feel hidden or unsafe. 3. Its special events and amenities – the reading room, the movie nights, the excellent kiosks with food and flowers. 4. Its commitment to the idea that the viewer/visitor/participant can enjoy the park for FREE. 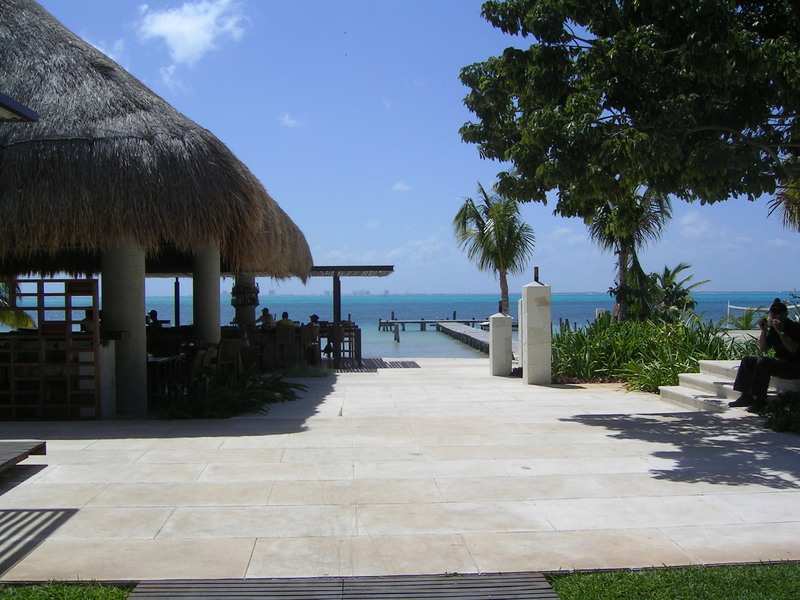 An area that is new is called the Southwest Porch, an outdoor lounge with golden yellow patio umbrellas and comfortable cushions on the attractive and weather-proof furniture. It was donated by Southwest Airlines and happily also provides power outlets to laptop-addicted New Yorkers and visitors alike. 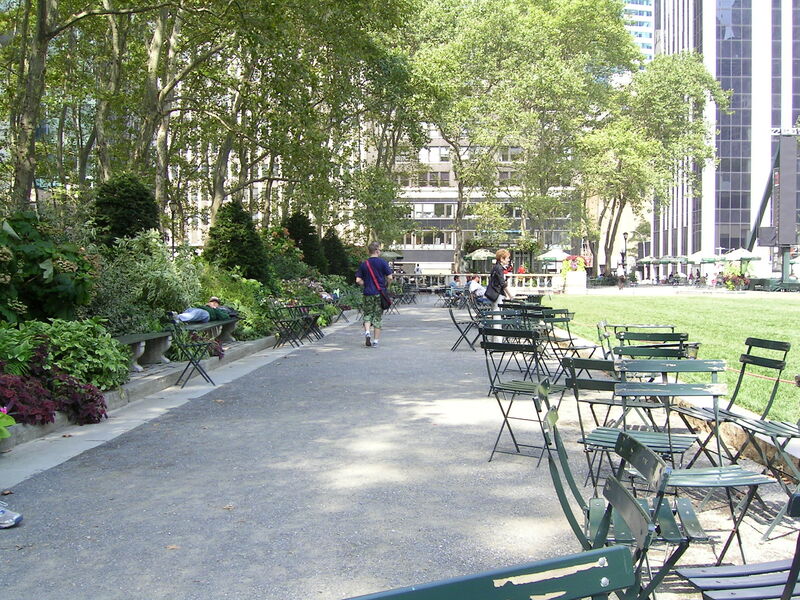 The Bryant Park website lists the following rules and regulations while visiting the park. I thought it was worth repeating since it gave me a chuckle and reflects the newer, friendlier New York – especially the directions for dogs. 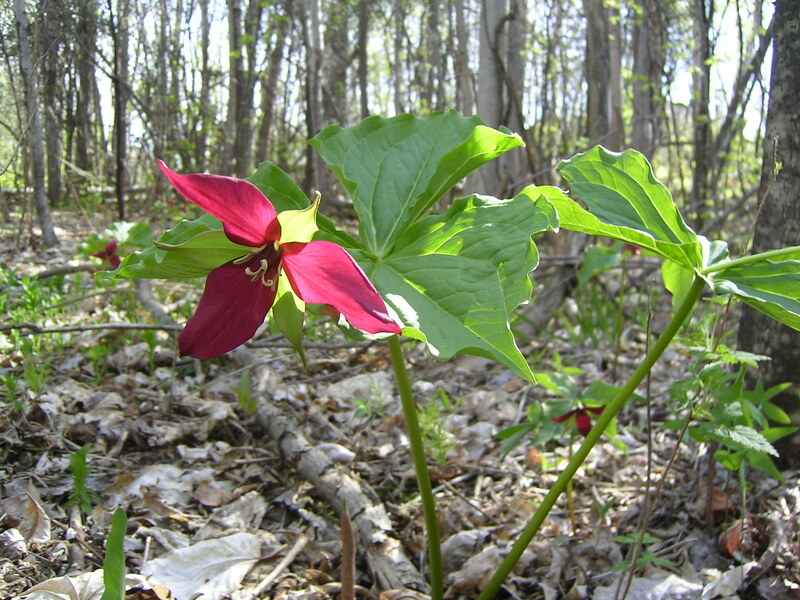 The white trillium (Trillium grandiflorum) that is Ontario’s provincial flower is not the only trillium in our woods. 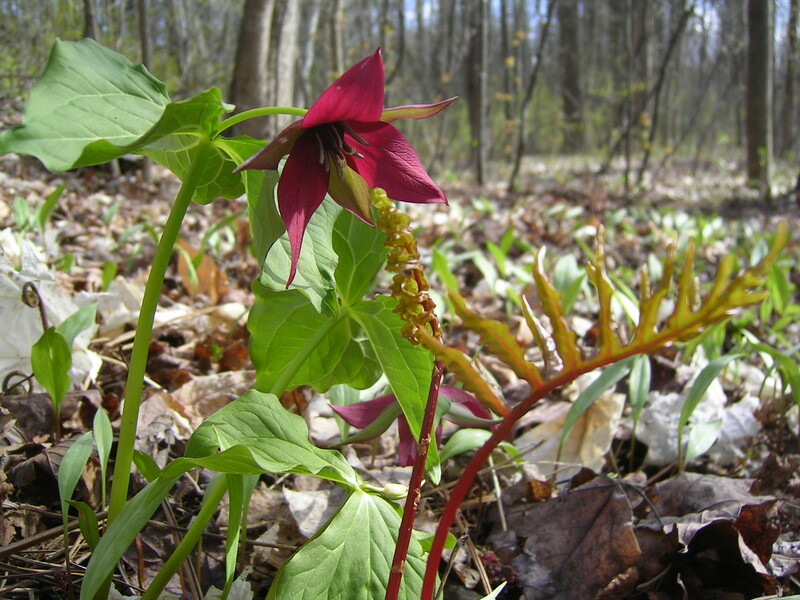 The red blooms of the wake-robin (Trillium erectum), that bloom slightly before the white trillium, provide a rich display in the spring forest echoing the ruby ribs of this Sensitive fern (Onoclea sensibilis). These spring ephemerals push up out of the leaf litter on the forest floor and then, when they’re finished blooming and their leaves have taken in enough energy from the sun (before the trees have leafed out and shaded them), they disappear back underground. 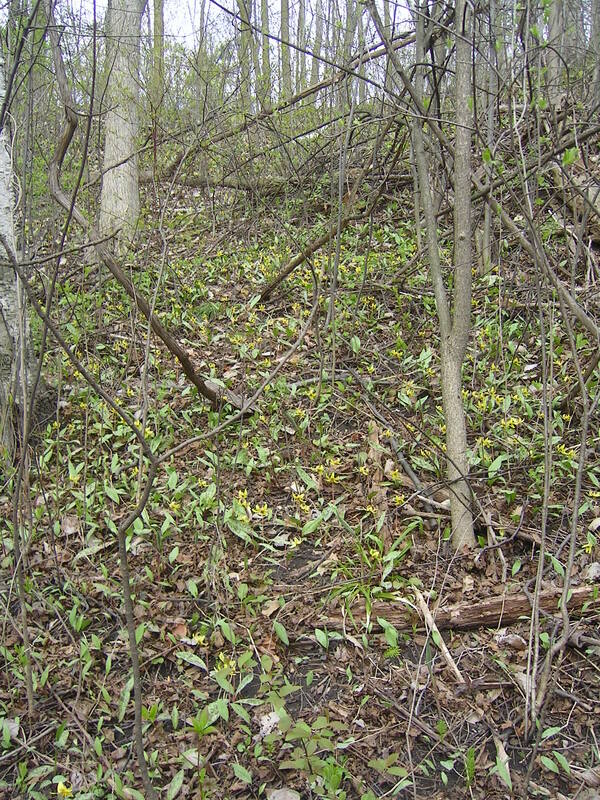 This same habitat is home to other spring blooming perennials that, if you look closely, often carpet a wooded hillside. 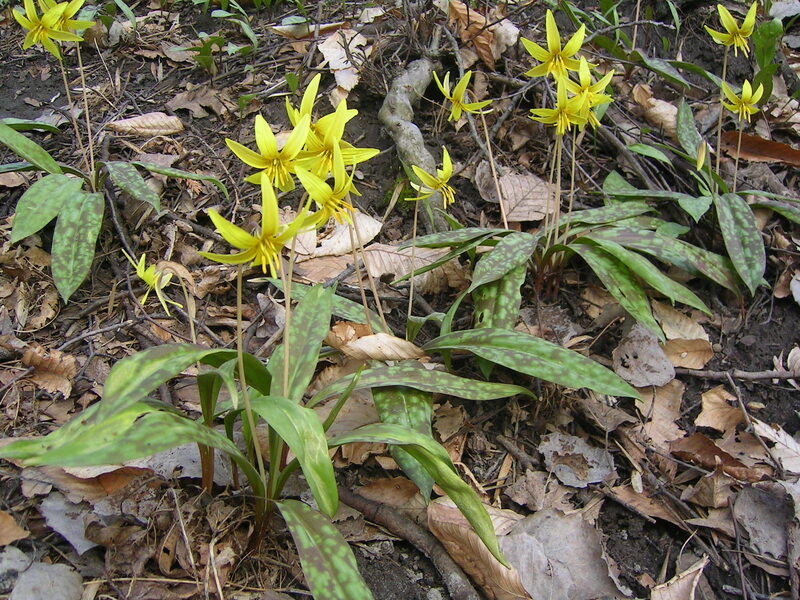 These dainty yellow blooms rise above a pair of spear-shaped leaves that are mottled in a burgundy brown pattern. 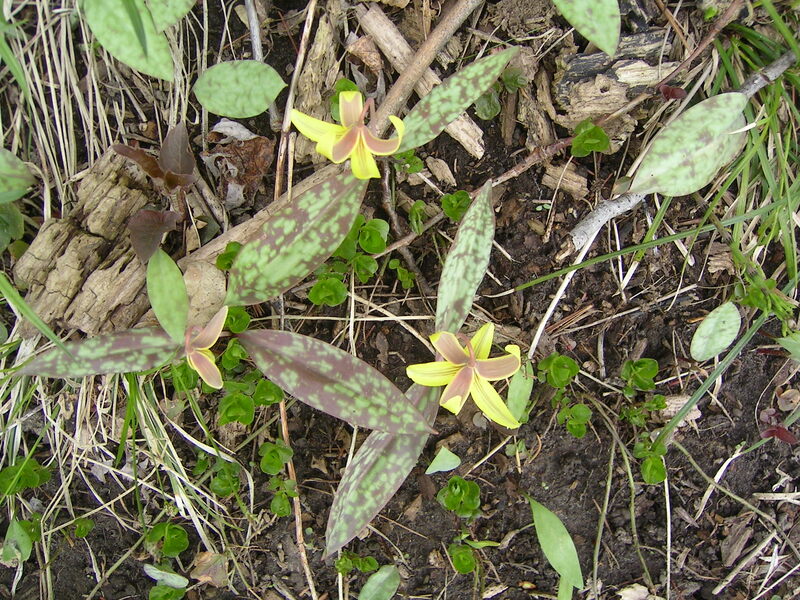 They are known as trout lily or dogtooth violet (Erythronium americanum), referencing this mottling or the canine tooth shape of the underground corm. 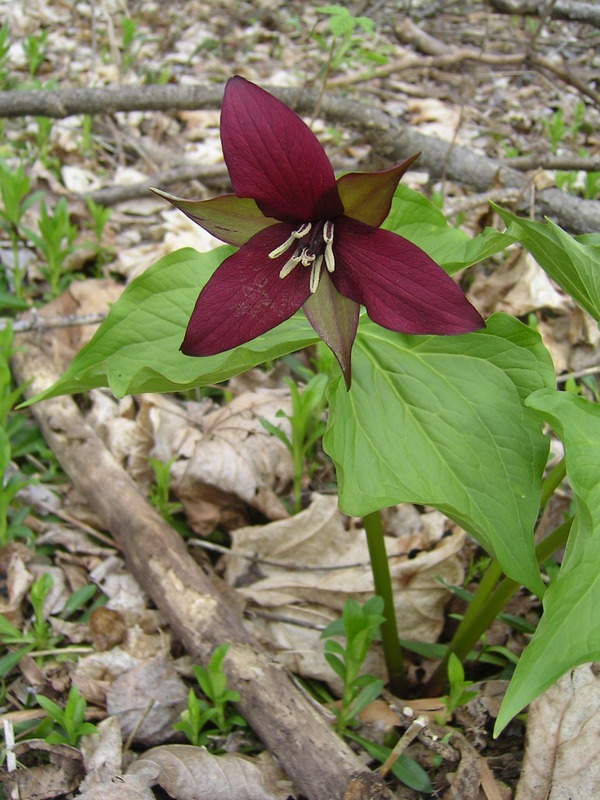 These little jewels carpet the forest floor for several weeks in the spring and then disappear, much like the trillium. Young plants have just one leaf and no flower; as they mature, they produce a pair of leaves but just one perfect golden bloom with three petals and three sepals (with their distinctive brown backs). Colonies are formed primarily by the corms multiplying, creating little corms (called ‘cormels’) around the base of each mother corm. 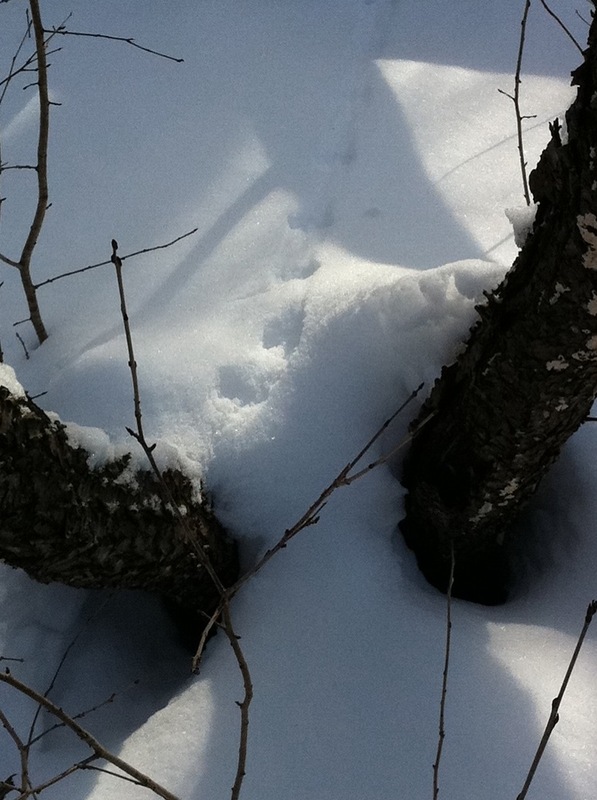 Think about how crocuses form huge populations when left to their own devices; they also grow from corms. With the warmth that the spring sun brings, the first blooms of the season suddenly appear. 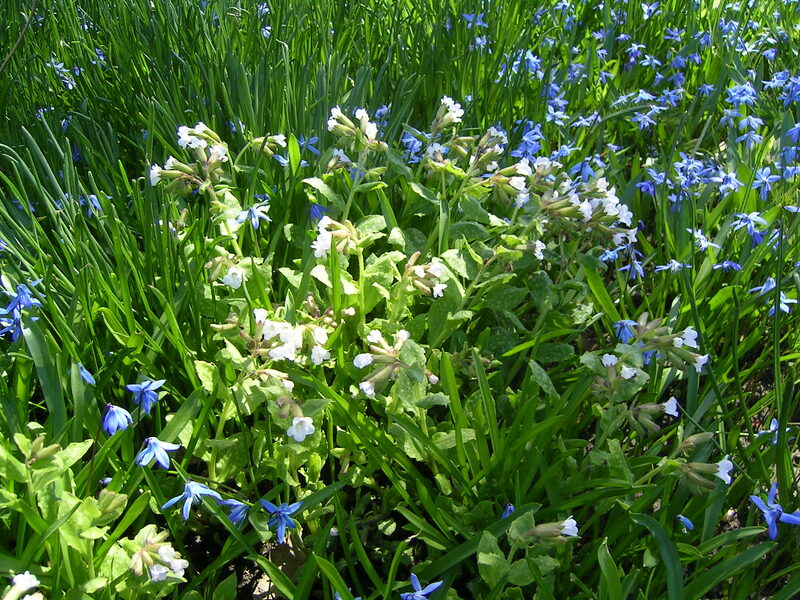 Here, in the ornamental gardens of Ottawa’s Dominion Arboretum, a languorous path is bordered by swaths of Siberian squill (Scilla siberica), one of nearly fifty species within the genus Scilla, a member of the Hyacinthaceae family. If memory serves me correctly, this whole area is also planted with a mass of hostas. This is a great planting tip for novices; overplant your bulbs with perennials that will camoflage the bulb foliage as it begins to die down. Pretty soon other spring flowering perennials will strut their stuff; these azure blue and pink blossoms belong to the shade loving lungworts (Pulmonaria sp; garden varieties are many including P. officinalis, P. rubra, P. saccharata, P. longifolia). These plants, with their spotted and bristly foliage are reliable performers in locations that stay shady and cool through the season. When their flowers finish and their leaves become tatty by mid-summer, they can be cut right back and new, fresh leaves will emerge and look much more presentable through the rest of the growing season. 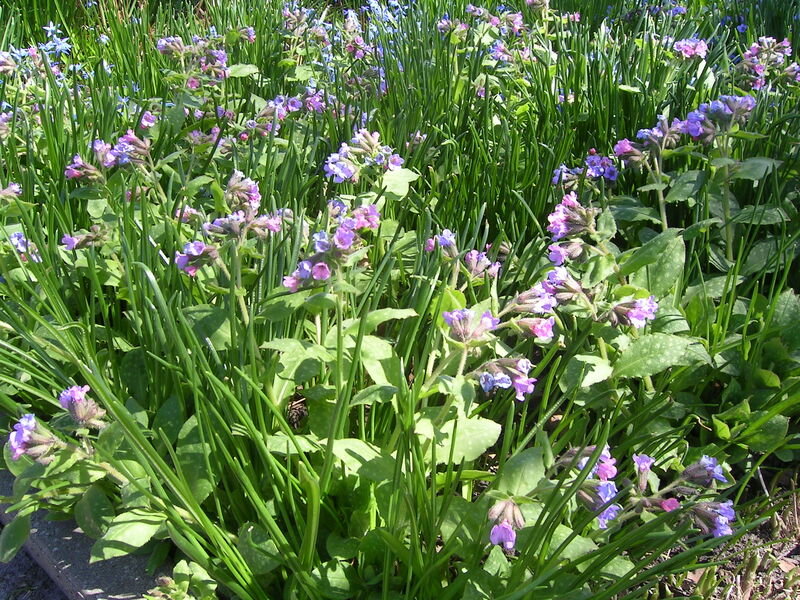 The flowerbuds of lungwort present as pink and as they begin to open, shift to blue/purple, creating a doubly colourful display. There is also a white variety called Pulmonaria x saccharata ‘Sissinghurst White’, that although it is less vigorous than the pink/blue types, makes for a classically elegant display. 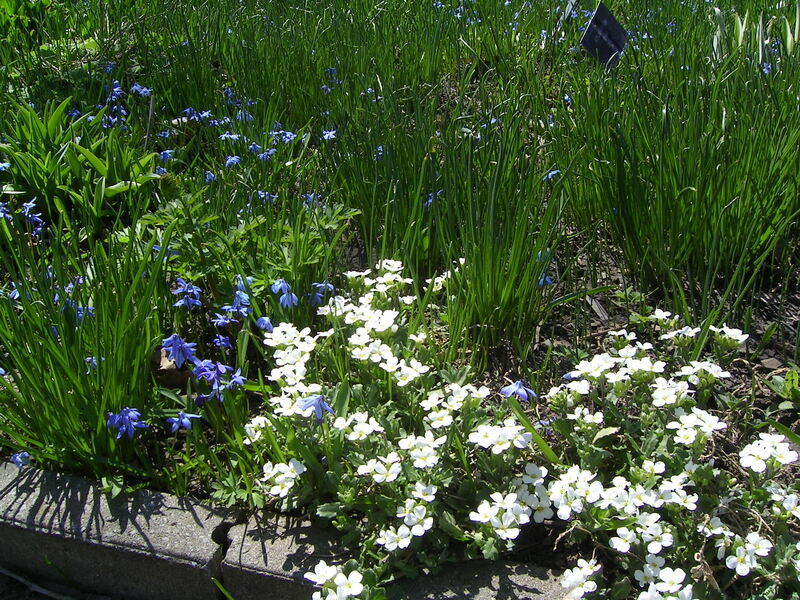 A very useful edging perennial is Arabis alpina or Rockcress. This mat-forming plant has fuzzy silver foliage and benefits from being placed in full sun with soil that is not too rich. It provides a bright highlight in the spring garden. And then there are the beautiful magnolias! 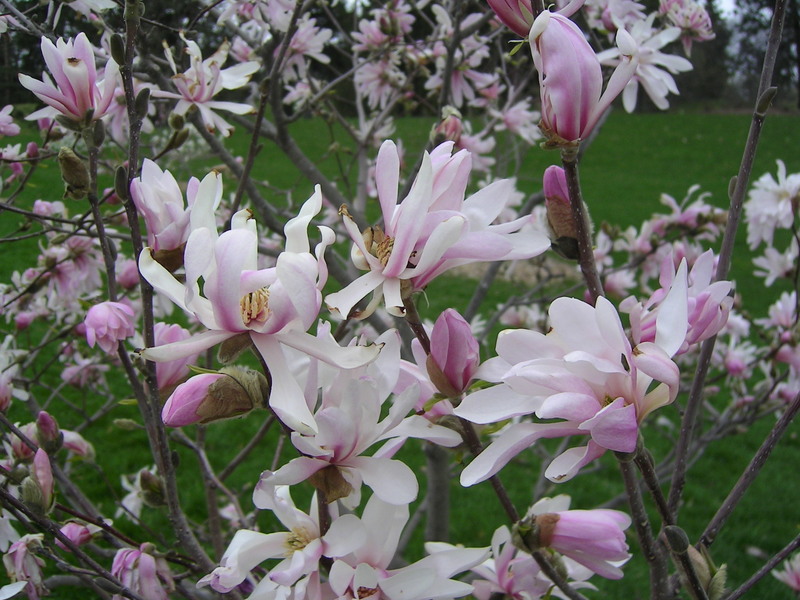 One of the largest hardy magnolias is the Saucer variety (Magnolia soulangiana), pictured here, with it’s huge and showy blooms. 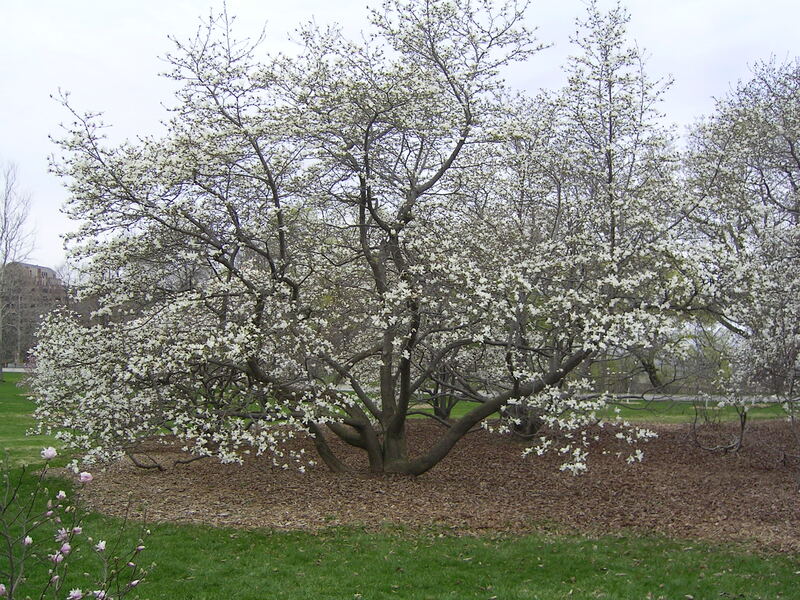 One of the reasons Magnolias are so stunning in bloom is the size of the flowers, the delicate blush of pink on white, the grey branches and the muscular, organic shape of their limbs. Sources for open-pollinated seeds are increasingly few and far between. This reality irked Anna-Monique West of Calgary, Alberta, and so she decided to do something about it. So last summer she started ‘SeedLiving’, a global marketplace for those who grow, harvest, and sell (or swap) open-pollinated seeds AND for those who want to source and buy them. Open-pollination matters because it is the oldest method of developing seeds, using natural mechanisms such as wind, insects and birds. Open-pollination helps increase biodiversity because it increases seed varieties. Gardeners who choose open-pollinated seeds can save them and hand them down to the next generation of growers. 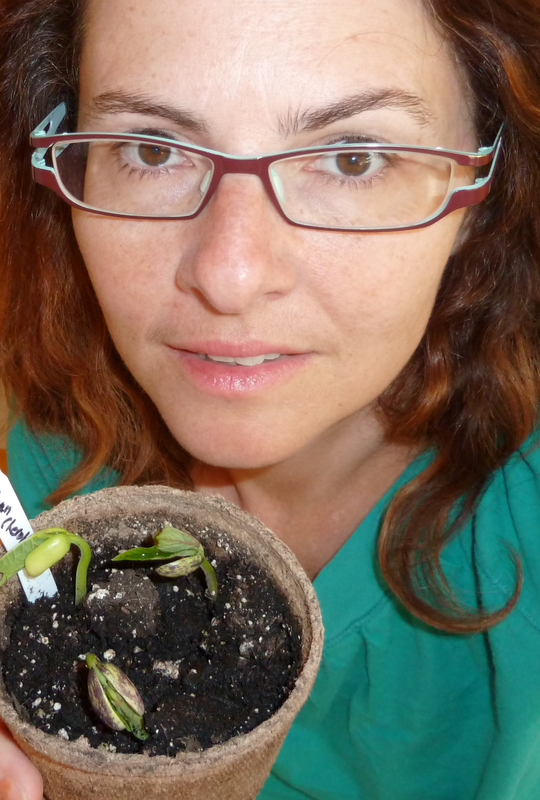 Saving seeds should be a human right. Seeds that are sold commercially are often hybrid, genetically modified, or patented; none of which can be saved. These seeds are bred in controlled environments for specific traits such as colour or firmness. 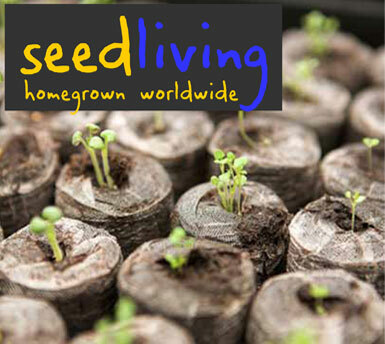 “On SeedLiving, users can buy or swap directly with growers. They know their seeds because they grew them. Many are organic, without chemicals, or heirloom. Growers are invited to start using this resource to promote heirlooms in their community. So get growing! Visit the site, register and take a look at who’s selling. 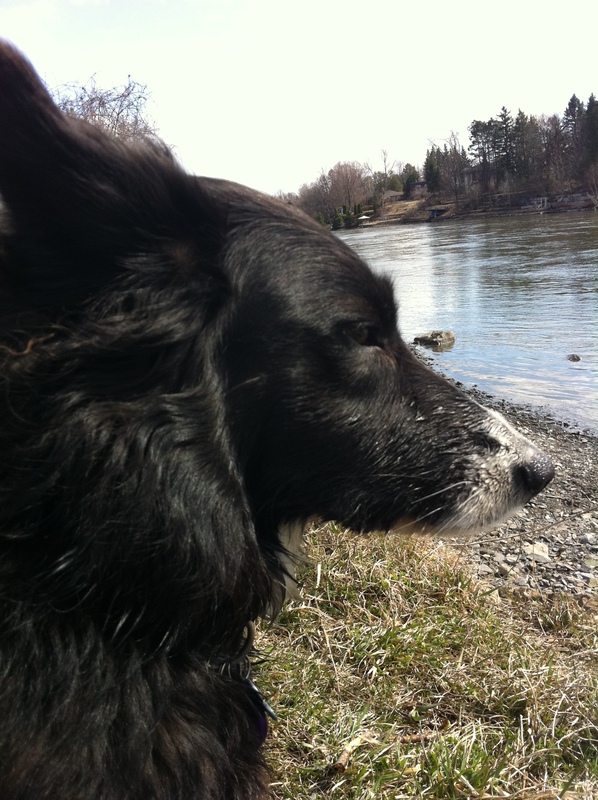 And for more background, take a look at the article I wrote for the Ottawa Citizen about Anna-Monique’s endeavour here. 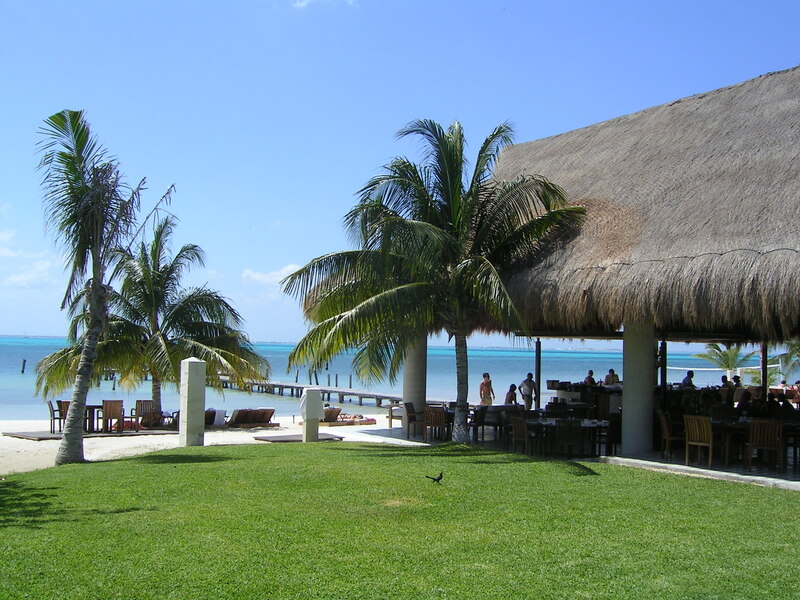 This incredible place is called Zama Beach & Lounge and is located on the tiny island of Isla Mujeres off the coast of Quintana Roo, Mexico, just opposite Cancun. We visited it for the first time a few years ago and then made a return visit the year before last. It’s the kind of place that you drive by on a rented scooter or a golf cart while investigating the nooks and crannies of this small island and almost don’t stop because you think it must be a private club or something. But, ever hopeful of finding that perfect spot on the perfect beach, we parked our scooters across the road and wandered in. “Of course!” he offered and I joyfully led poor Kent to a table for a cold drink and lunch. We discovered that the only catch to staying and taking advantage of all the amenities here is that you must spend a certain amount at the bar and/or restaurant — I think it was the equivalent to $40 per person. 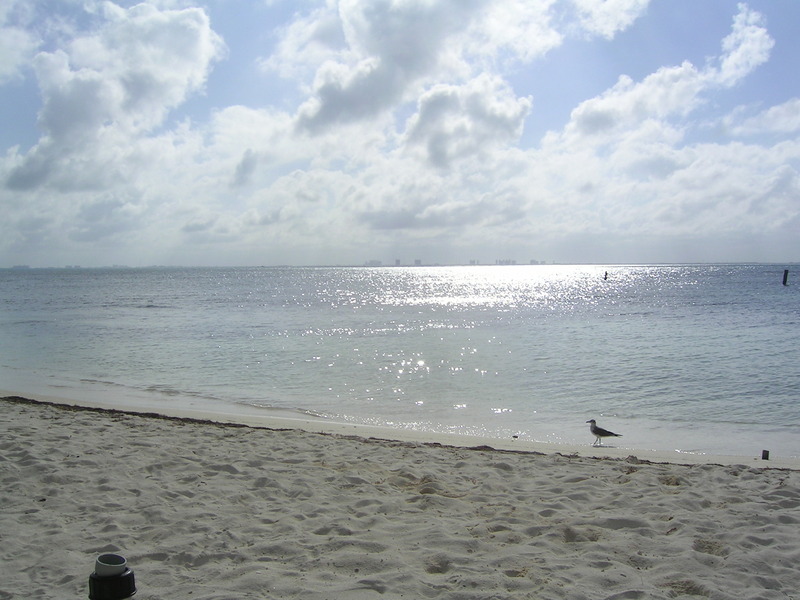 But this was NOT a problem, since the beach was lovely, the drinks were cold and the food was really good. I ordered something like a marguerita (above) and a ceviche plate. Surprise — I think K had a burger. All was really, really good. The second time we visited, there were two lovely women set up with massage tables over to the left in the shade of the palm trees and I took advantage; it was one of the best massages I have had. I’m sure the location helped. There are beautiful open air washrooms and changing rooms, lots of different areas in which to sit, even a small pool if you prefer that to the ocean and no one hurrying you. 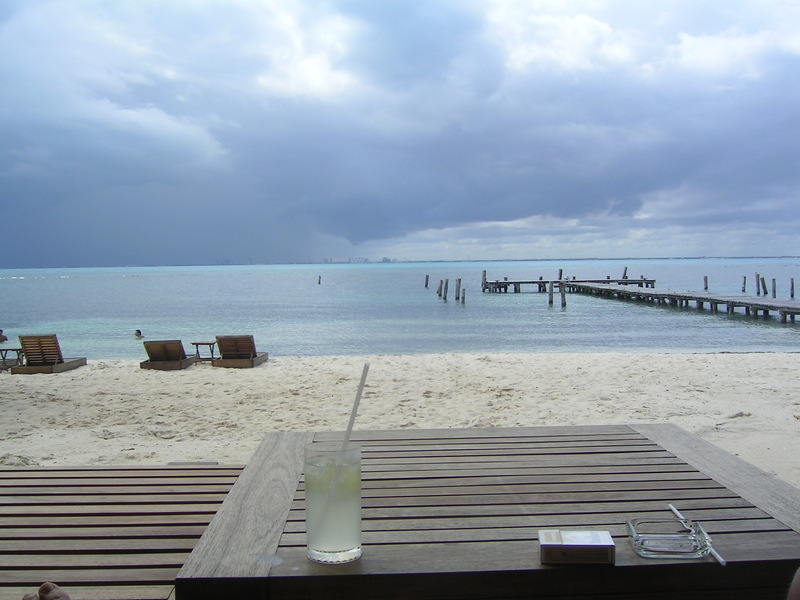 The perfect spot to spend a lazy Mexican afternoon on a fairly undiscovered part of Mexico, just a stone’s throw (ferry ride) from Cancun (which you can see across the water and be so relieved to be where you are instead). 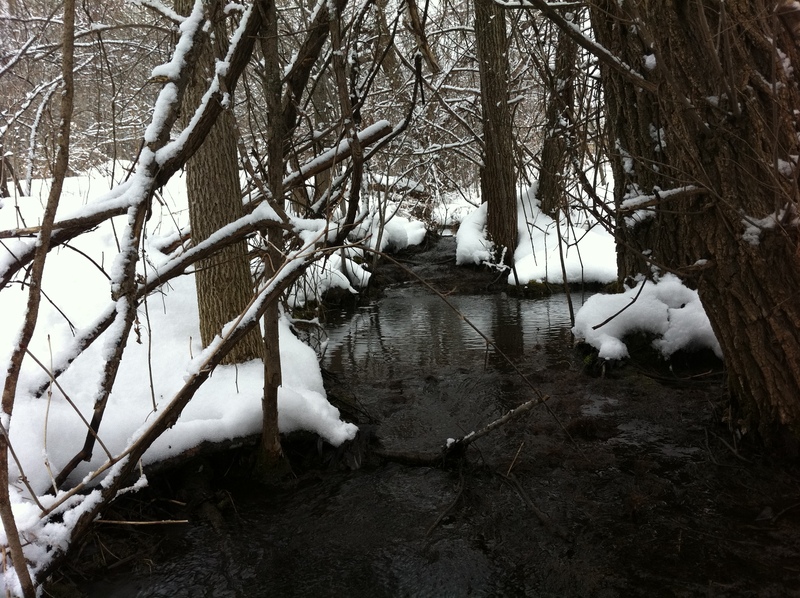 Here’s just a last look at winter since I KNOW it’s on its way out. 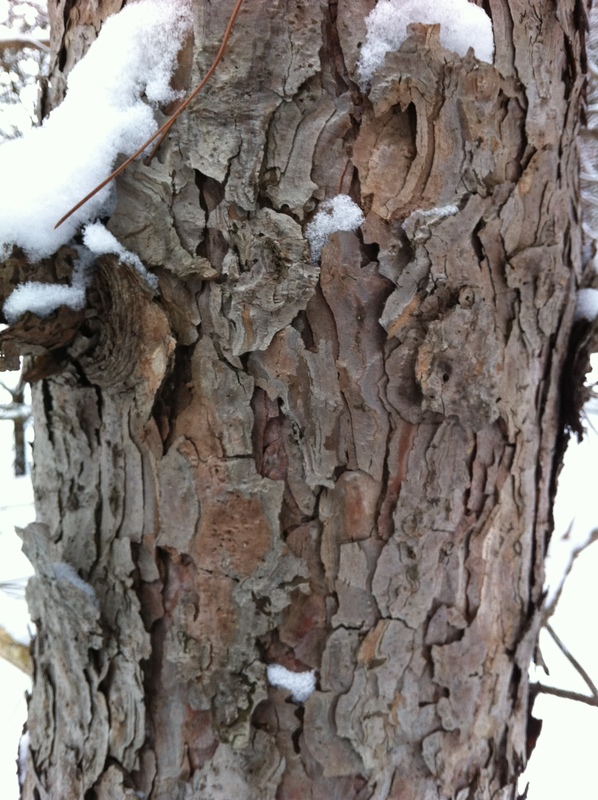 But the ‘renaissance’ light and the puffy, freshly fallen snow is one of its few redeeming features, imo. 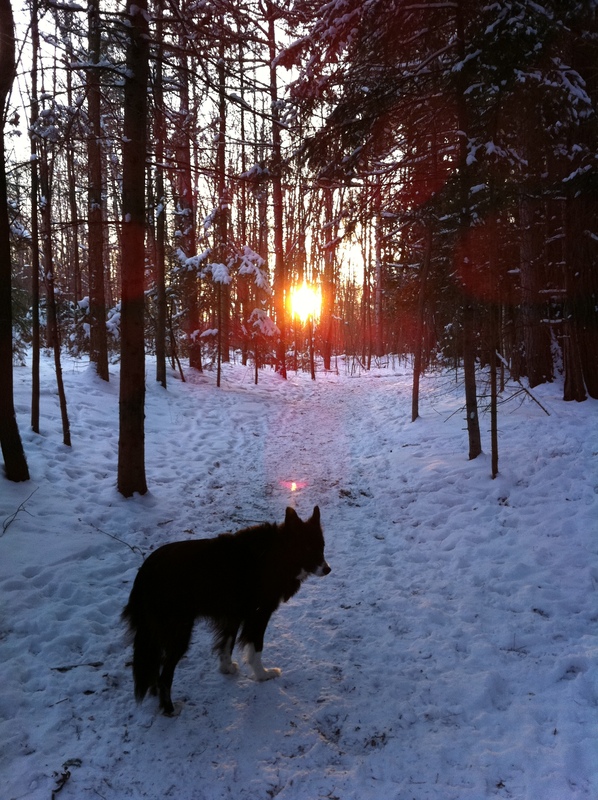 The sun shines for a much longer day now but in January, a 3 o’clock walk would allow you to see the sun already starting to go down! And the barren quality of the landscape allows you to see things that you would otherwise overlook. What ‘choo say? 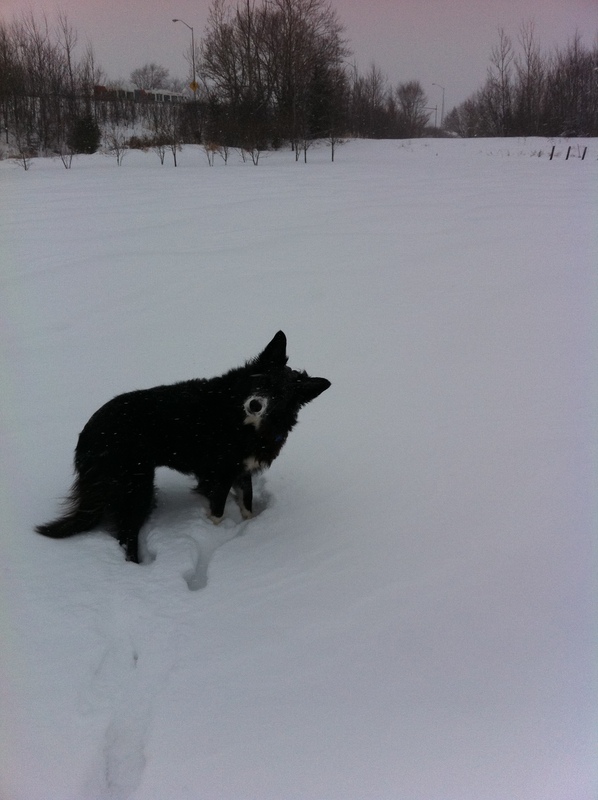 Is there life under here?